Gosick – first episode will decide if i’ll continue or not. This entry was posted in Anime, Season Preview and tagged anime, anime season previews, beelzebub, kimi ni todoke 2, Level E, starry sky. Bookmark the permalink. Haha, my two #1s are on your “not that excited about” list. Gosick and Merry Dream Eater. Of course Merry Dream Eater is only on my list because it makes mentions of war with cats. Even just in dream form, wars with cats amuse me. lol, wow, cats battling in war? nice, nice. maybe I’ll look forward to this one too then. ahah. i will preview this post and link back here (coz i’m too lazy to research up-coming anime list heheheheh). procrastination got the better of me. ahah, I’m hoping there will be lots and lots of sparkles and that the guys will look nice and charming. lol, hopefully you wont be disappointed when it starts airing then. i’m hoping i wont find the main chara’s hair annoying like you did.. ahah. Lol I’m still procrastinating on my school work right now haha. ahah, that’s bad. you should do it now or it’s going to be too late. Right.. sometime … soon… well it’s christmas break for me so… I can do.. it… sometime…. Yea, it’s like all the great male seiyuu were casted for this ^^ oh yeahhh the main character is a girl. Well the anime is based on an otome game where the player is the only girl in an all boy school ^^ pretty typical plot. lol.. how would I NOT know? ooh, the preview/advanced screening thing? .Hmm, I’m interest in seeing what kind of a shojo heroine she’ll be though. wah .. i can’t believe that anime is also covering zombies… i thought only hollywood. i guess it’s the trend. Looking forward to Kimi ni Todoke 2 and Beelzebub as well, the former may have been kind of uneventful but it was nice for what it was. Plus I sort of have a soft spot for characters voiced by Mamiko Noto, the latter on the other hand depends on how Studio Pierrot handles it. The manga isn’t anything special but it’s definitely pretty fun for something running in Shonen Jump, and I’m interested to see how some of their voice actor choices will work out. For some reason Mahou Shoujo Madoka Magica screams that it will be glorious, how it may be a Magical Girl sort of show may not say much. But all you have to consider is that Urobuchi Gen will be writing the script (see Nitro+) and it will be animated by SHAFT with Akiyuki Shinbo as the director. So while SHAFT and Shinbo’s style is more of a love it or hate it sort of thing, it’s definitely something with potential. Ooh, so you’ve read the manga for Beelzebub? Are you going to be blogging both series? Yeah, it was pretty fun as a delinquent comedy with things like just punching harder being “secret moves”, so probably. There are always a few shows that I wish I had blogged each season though. The OP and ED do sound nice, and the animated sequences should be pretty good in typical SHAFT fashion. 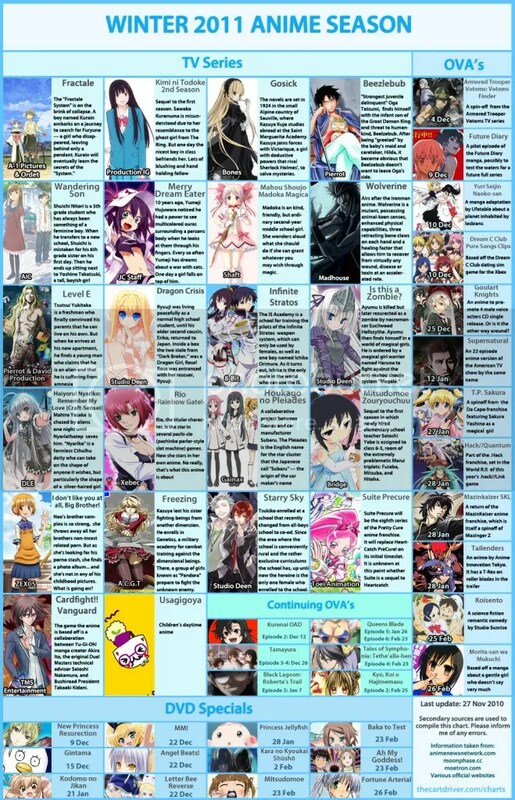 They’re generally associated with stuff like Sayonara Zetsubou Sensei, and more recently Bakemonogatari and Arakawa. All of which were also directed by Shinbo. Angel Beats! on the other hand was P.A. Works coincidentally with Key’s main author, Jun Maeda. Which ones are you thinking of blogging for Winter? Ooh, if its going to be in a way similar to Arakawa then I’ll really be looking forward to it then. I’m excited to see the animation of Madoka Magica. Ahh, okay, thanks for the clarification. Possibly Kimi ni Todoke, Madoka, Fractale (it looks like it has the potential to be a nice adventure story), and Beelzebub depending on how Pierrot handles it. And it should be a bit like Arakawa, though personally I’m more interested to see how well something like it will contrast with Urobuchi Gen’s past works, which are usually pretty dark. Well, I’ll be looking forward to your thoughts on Kimi Ni Todoke 2 and the rest then. Hmm, that sounds pretty interesting since it’ll be something different from Gen’s previous stuff.